Family owned and operated since 1990 by Ron and Jamie McManis, McManis Family Vineyards now sustainably farms over 3,600 acres of premium wine grapes located throughout the Northern interior and Clarksburg Delta regions of California. 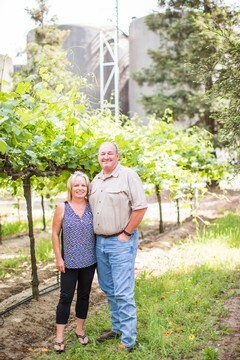 Justin McManis, Tanya McManis Heuvel, and son-in-law Dirk Heuvel, the fifth generation of family farmers, all work full time at McManis Family Vineyards. The McManis family has been growing grapes in this region for five generations. McManis Family Vineyards has been one of the leading wine and grape producers since 1990. McManis Family Vineyards is known for ultra premium grape growing featuring selected rootstocks and clones, leaf pulling, cluster thinning and drip irrigation. Along with an eye for detail in the vineyards, their commitment to sustainable practices has led them to pursue green certification. In 1997, the McManis family’s commitment to producing quality wines under the family label was firmly established when a state-of-the-art production facility was designed and built to maximize wine value and consistency. Attention to detail comes in the form of small lot fermentations, whole cluster pressing and oak aging - all designed to provide McManis Family Vineyards the tools they need to produce the finest wines possible.